Georgia and I finally got to actually go somewhere in a small airplane. This particular trip was always planned to be our first flight away from home base but, for various reasons, it has taken us a long time to make it happen. 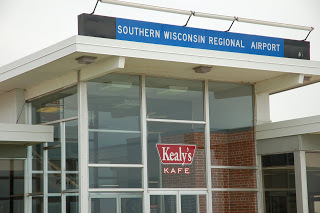 Friday afternoon,we flew from Waukegan to Janesville, Wisconsin for a late lunch at Kealy’s Kafe. It wasn’t a long trip but, it qualifies as a cross country and was our first together. Every forecast for Friday looked good on Thursday so, I scheduled an airplane for 2pm. I would leave work early, Georgia would pick me up and we would go straight to the airport. By Friday morning though, things weren’t looking as good. The aviation forecasts were still OK but, the local news stations were calling for rain showers. I kept an eye on the radar at AccuWeather during the morning and, it showed a huge area of precipitation over us. Apparently it wasn’t reaching the ground though because all the METARs continued to show good visibility and no rain. By noon, I decided we should at least give the flight a try so, I called Georgia and told her the trip was still on. She picked me up at 1PM and we were at Skill before 2PM. The airplane was there but hadn’t been fueled. The tanks were well over half full though and, since our whole trip would be just a little over 100 miles, I chose not to wait for the fuel truck. The sky was overcast but the visibility was still good so I did the preflight and we got in the air. Once airborne, we could see why the radar was showing all that precipitation. At 4500 feet, we flew through a couple light showers on our way to JVL. I could still see at least 15 miles ahead so there was no problem navigating and, 30 minutes later, we landed on runway 32 at Janesville. A short taxi to the terminal and we parked right outside the door to the restaurant. Kealy’s is a popular place with local pilots but, this early in the day, there was only one other airplane parked on the ramp. We went inside and had an excellent lunch, got back in N35092 and were soon nearing Waukegan again. When I called the tower, I asked for one touch and go followed by a full stop. Both landings were good and now I am current to carry passengers for another 90 days. It was a short trip but, an important step in our flying together. Now that we have stretched our wings a little, we can start planning longer flights. Sounds like a fun flight and good eats! Now the door is open to a whole new world of fun flying…..oh and gliding! Best part about the flights are having our “co-pilots” with us to share the passion. Thanks Gary. It is great that Georgia is happy to fly with me. Now, I have to convince her that gliders are safe too!